Nomination guidelines and forms are posted in January. 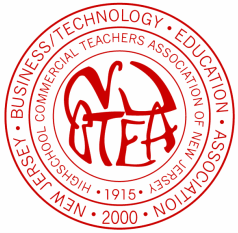 The purpose of the NJBTEA Educator-of-the-Year Award is to recognize outstanding contributions to the field of business education through leadership, teaching, service, publication, and research. A plaque will be presented to the recipient at the annual NJBTEA Spring Conference. Any NJBTEA member may nominate any eligible NJBTEA member for the award. Joanna Sisco Business Teacher Award—The nominee must be enrolled in a collegiate/university business teacher education program. Each recipient and his/her nominating NJBTEA member will receive a free registration to the NJBTEA Spring Conference, at which time each recipient will be presented a plaque. The High School and Post-Secondary Business Student Award recipients will receive $250 each. The Joanna Sisco Business Teacher Award recipient will receive $500. Do you know an NJBTEA member who consistently maintains a high level of professionalism, is dedicated, and involved in activities for and about business? Do you believe that this educator deserves recognition for all he/she does? Would you like to see this person acknowledged in our newsletter? Would you like to see this Unsung Hero and yourself receive a free membership for the next NJBTEA membership year? If you answered YES to any of the above questions, then take action now. Send your Unsung Hero nomination to Robert Carson at rcarson@burltwpsch.org along with a brief description of why you believe that this person should be acknowledged. These names and brief commentaries will be published in the NJBTEA newsletter. All names received by April 19, 2019 will be put into a drawing for a free membership in NJBTEA for the 2019-2020 school year. Both the winner and the nominator will receive free memberships. Send in your nomination today before you forget and give recognition to a deserving colleague!